The quirky city of Stepanakert is the capital of Nagorno Karabakh, a self-declared country in the Caucasus region. Yet, despite its unrecognised status as a country, the city is well located when touring the region, and has easy bus access to other towns such as Shushi, Vank and Tatev in Armenia. At night, the city has a calmness about it and some truly cosy little bars and restaurants in which to enjoy fine cuisine and a few casual drinks. With a reputation for excellent coffee and tea, Pyatachok Cafe-Bar remains a firm favourite for those who like to relax. While the venue doesn’t have an extensive range of Armenian food, they have some great salads, cakes and sweet treats. It also holds a prime location on the main roundabout on the Azatamartikneri Avenue side of Renaissance Square. Степанакертская эстетика: конфеты с сахаром. 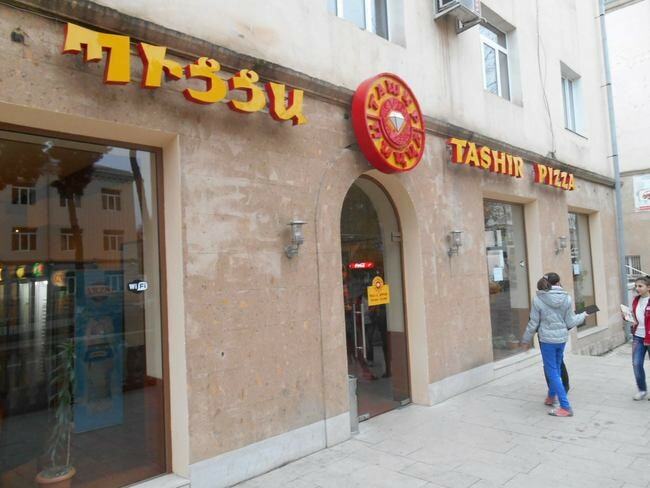 For an Armenian take on pizza, great pasta, a choice of beers and free Wi-Fi, the centrally located Tashir Pizza is the perfect spot. This restaurant has a few rooms and it overlooks Stepanakert’s main street Azatamartikneri Avenue. The pizza range is probably the best in the country, and there is a wide variety of Mediterranean dishes which changes from time to time. It is one of the most popular restaurants in the city. Head to the city’s swankiest and most popular hotels for dinner, even if you are not staying here. The Hotel Yerevan is situated in the heart of the city, by Stepanakert’s Renaissance Square. It has been the main hotel for tourists for generations. The best chefs continue to serve up a variety of food in the main restaurant with an Armenian-focused menu. It is also open for breakfast, but if you are a non-resident, you will have to ask permission to enter the dining room. Florence Garden continues to attract excellent reviews for both its food and its overall ambience. Fresh local food is used in a menu that includes pizza or lahmajoun (very common in Stepanakert restaurants). A range of alcohol is served including locally made brandy and Armenian lager. The venue has a well decorated interior and sometimes live music. For a traditional Armenian banquet in the company of friends, Ureni Restaurant is the place to be. Huge helpings are served and placed in the middle of the table to be shared. As a tourist, if your Armenian hosts or friends invite you here, make sure to try some of the local Karabakh dishes such as tanov apur (an unusual soup made from yoghurt and sour cream), plus the mandatory large plates of grilled meat to be shared with vegetables on the side. The Roots Restaurant has good value tasty food and drink in a cosy environment. The staff understand English, and the venue is equipped with Wi-Fi. They do a range of burgers including a pulled pork burger and a chicken burger. Homemade pasta such as their Napoletana are also popular. Drinks-wise, this is the best option for a late-night feed and some good alcohol in a pub atmosphere. Bardak Pub was also one of the first Stepanakert-based venues to have its own Facebook Page. Bardak is one of the most up-and-coming venues in the city, with its artistic interior, art-covered walls and live music. It stays open until 1 a.m. most evenings.